Well, my first week of outfit planning is off to an alright start. I think it was the most useful on Monday, making the transition from the weekend to the workweek a little easier. I scrapped one planned outfit for logistical reasons, and then downgraded another from a fussy jacket to a warm cardigan, on account of heavy wind and rain. In doing these recaps, I'll probably just focus on my favorite outfit of the bunch, in order to keep these posts to a manageable length. I'll give you two guesses to figure out which outfit that was this week, but suspect you'll only need one. 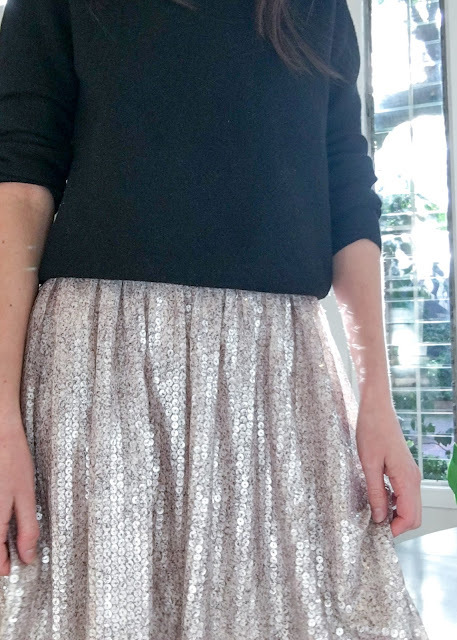 This skirt, in all of its sequin glory, is Sally LaPointe, purchased online from UAL. It was a perfect kick-off outfit because I want to really embrace my fun, frivolous clothes and just get them out into the world. 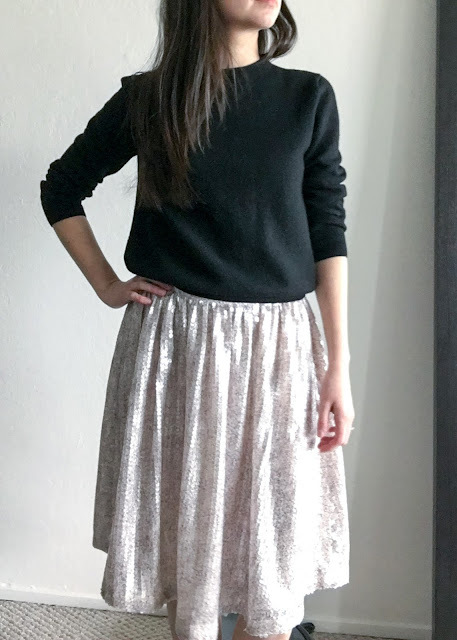 I can really only describe my skirt as liquid shine, and you almost don't notice the individual sequins until you are up close (photo below). The sequins are all individually printed (which is nuts). 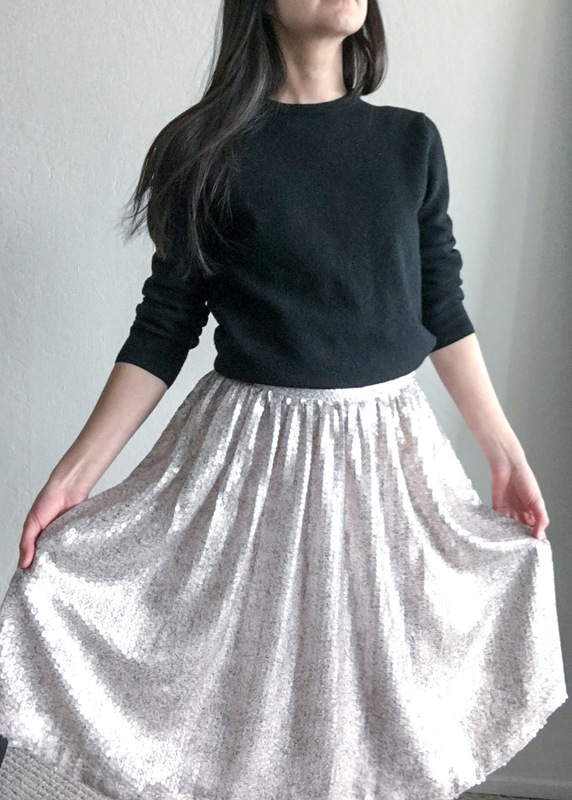 At first I thought the cloth behind them was printed (there is a really faint brown speckling pattern) and the sequins were clear, but no, each individual sequin is actually printed. I paired it with a simple black sweater, because I frankly wasn't sure what else would compliment it. My only misstep was the fact that I'd never worn this skirt out of the house before Monday, when I wore it for 9 hours straight. The skirt was originally a midi length, but I had it shortened to fall just past the knee, as otherwise it was too much skirt. (As an aside, I think my local tailor shudders when she sees me coming, as she knows that it must mean I have a real project for her. I'm sure she misses the days I used to only ask her to hem jeans.) As a result, when I sit, the bottom row of sequins is now right under my knee, and is kind of scratchy. It wasn't so bad at first, but by 6 pm, I was ready to take the thing off. 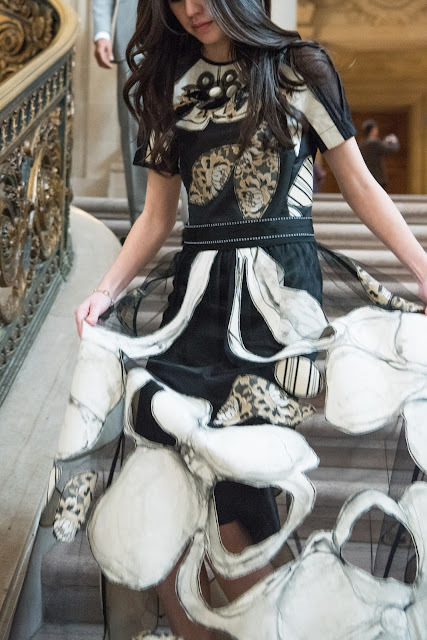 In the future, I'd probably wear tights or see if there is something I can add to the back hem as a buffer. Have you ever worn sequins to work? If so, how'd it go?